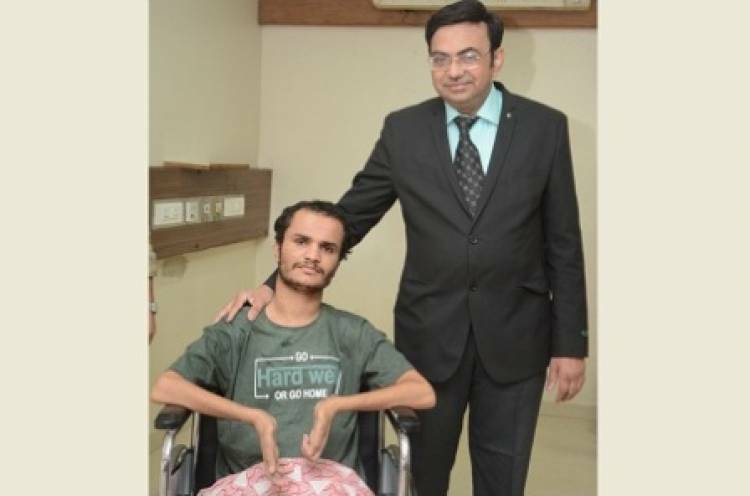 Pune, October 26th 2018: Your greatest challenge is also your greatest opportunity – proving these famous saying doctors from Universal Hospital successfully completed spinal cord reconstruction surgery and gave a 22-year-old a new lease of life. A team of four doctors from Pune, led by renowned orthopaedic Dr. Anant Bagul successfully executed one of the rarest surgery. A surgical procedure was performed on 22-year-old Yemen national Mansoor Mohammad Hussain– who was injured due to bullet shot which hit him in his neck while he was serving the Yemenese army in the ongoing civil war. The impact of bullet was such that it paralysed his entire body majorly impacting the upper side of it. Mansoor who was shoot six months back was referred to Dr. Bagul. Mansoor, whose health was in a very bad state six months back, has shown excellent improvement in sensation and muscle power. In the first of two operations conducted on Mansoor, surgeons removed patient's mesenchymal stem cells from bone marrow and they transplanted the stem cells and growth factors harvested impregnated on a scaffold graft into the spinal cord defect, which had been cut through in gunshot bullet injury . They had just a few drops of material to work with - about 500,000 cells. The doctors believe the stem cells provided a pathway to enable fibres above and below the injury to reconnect, using the nerve grafts to bridge the gap in the cord. The team led by Dr. Anant Bagul was more than ably supported by Dr. Anand Katkar, Dr Shrinivas Shintre, Dr. Sachin Kaushik, Dr. Dipak Poman and Dr. Manoj Bansode respectively.